One reader commented that this was the nicest Prius he’d ever seen. Good one, Chris! On first glance, it appears that this IS a reskinned Prius, and that’s it. I’m glad to report there’s much more to it, and if you find this car to be the right fit for you, your needs and your lifestyle, you’ll be quite happy with it. As long as you are OK with a car that’s dealing with a dichotomy of personality and seems a bit confused about what it is setting out to do. 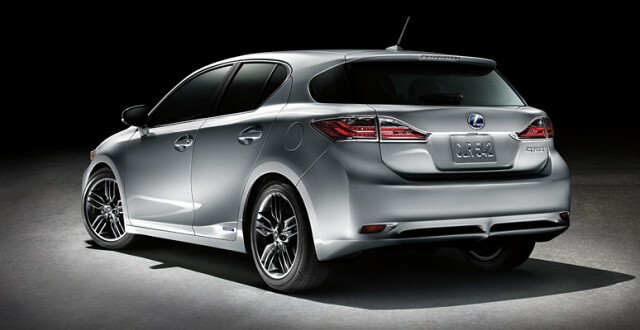 The Lexus CT-200h is Lexus’ most-affordable vehicle. It starts at CDN $30,950, but can sneak up the price ladder quickly due to expensive option packages. The one I tested rang in at CDN $38,035.20, everything in – it added the $5,000 Premium Package, which includes 17″ rims, CD changer (because everyone uses those nowadays), 10 speaker upgrade, leather seats, moon roof, back-up camera, and other goodies. The CT is a small car. I liked the front end styling, with a hint of aggressiveness, nice HID headlights and a distinctive horizontal strip of LED driving lights. Smooth flowing lines continue over the roofline and down the sides with a low character line that kicks up a bit before the rear fender. 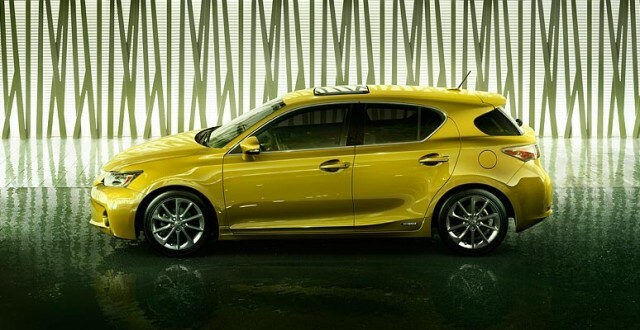 From the side, nobody would be faulted for mistaking this for a Mazda 3 Sport at first glance. The similarities are striking, but I guess Mazda will take imitation as a sincere form of flattery. It’s a good shape and it works here too. I take issue with the rear end styling on the CT and found it hunchbacked and undecided. It felt a bit at odds with the smooth styling on the rest of the car. I thought the rear lights look a bit pinched and the horizontal diffuser at the bottom didn’t appeal to me as much as it did on paper. It’s not bad, I just didn’t like it as much as the front and sides of the car. There are some interesting angles around the rear wrap-around window and how it all plays into the fender and hatch, but overall I thought it was pretty cool and pleasing to look at, and mostly clean. The CT has a hybrid drivetrain – it uses a 1.8-Litre, 4-cylinder running on the lean, but torque-poor Atkinson cycle, coupled with an electric motor. Combined, they put out 134 horsepower and 152 lb.ft of torque. Drivers with memories for numbers will recognize this power plant – it’s the same one in the Prius. Clearly the focus leans toward fuel economy rather than performance, and the car is rated at 4.5 L/100 km (52 mpg) in the city, 4.8 L/100 km (49 mpg) on the highway and 4.6 L/100 km (51 mpg) for the combined cycle. Usually I chortle heartily at these ratings, because you can’t achieve anything close to them. Until I drove this car. I averaged a ridiculously low 5.3 L/100 km (44 mpg) during my time with it, and that was all city driving in Sport mode, which is the least efficient way to drive it. 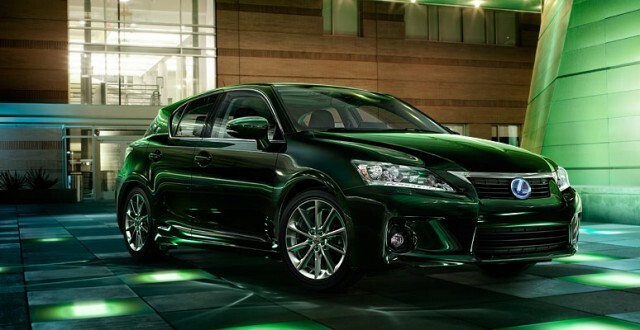 Suffice it to say – incredible fuel economy can be realized with this car. The interior is done very, very well. 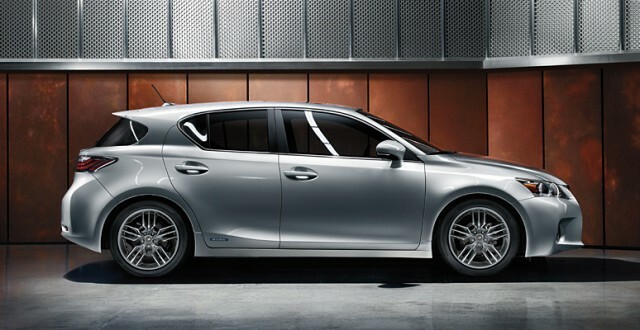 In typical Lexus fashion, materials are absolutely first-rate. Gorgeous soft-touch plastics abound, blessed with lovely textures. You’ll find beautiful leathers, and you’ll find beautiful stitching. I will say that Lexus interiors are top-shelf, and it goes for their entry-level car as well. With all that said, don’t expect the level of opulence you’ll find in higher-end Lexus models, with oceans of woods, etc. This is luxury, but sportier luxury for lack of a better way of saying it. When I plopped myself into the seat, I thought to myself, “THIS is how a seat should feel.” They’re fantastic thrones, offering great support and bolstering, and would be at home in any sports car. The leather is lovely, including the perforated inserts. Both front seats are heated, the driver’s seat being power adjustable with 3-position memory. Speaking of seats, I’ve heard (but haven’t seen) that the faux-leather seats are very good as well. When you get into the CT, you realize just how small of a car it is. The headroom is OK, but leg and knee room are pretty snug. I appreciate that Lexus padded the side of the center console, so resting your knee against it is actually relatively comfortable. I loved the steering wheel. It has a fat rim, is just grippy enough, and has controls for media, driver information screen, phone and handsfree operations. The dash is nice and simple. In front of you sits a clean gauge bin, with a big, clear speedometer, and a variable gauge on the left. Switch the car to eco mode, and there’s an eco gauge showing what’s happening with your hybrid charge and a lovely blue horizon over the gauges, which must signify how much you’re doing to save the world. Flip it to sport mode, and it turns to a tach, with a mean red horizon over the gauges, showing just how speed-racer you just got. It’s a bit goofy, but it’s also fun. There’s a driver information screen on the right. The front third of the center console angles up into the center stack, which is visually interesting and quite effective. That angled section includes your gear selector, which is a strange duck, and the audio system. In my opinion, the layout works nicely. This car feels loaded with tech. I felt like a techno-weenie just driving it, and I loved that. First off, the audio system sounds spectacular. Regardless of source (AM, FM, satellite, CD, auxiliary, USB or Bluetooth streaming), it sounded great. There’s no big screen – just a simple, highly-readable wide display – it did everything I needed it to do. The audio system is an exercise in ergonomics, and very well done. The driver’s information screen was another great thing, using the space it was given. It’s one of the smallest I’ve ever seen, yet one of the best. The tiny screen was very readable, and always allows you to see your odometer, 2 trip meters, outside temperature as well as flipping through average fuel consumption, instant fuel economy, fuel range, elapsed driving time, average speed, a hybrid power-delivery graphic and the vehicle settings. Very useful, and very well done. 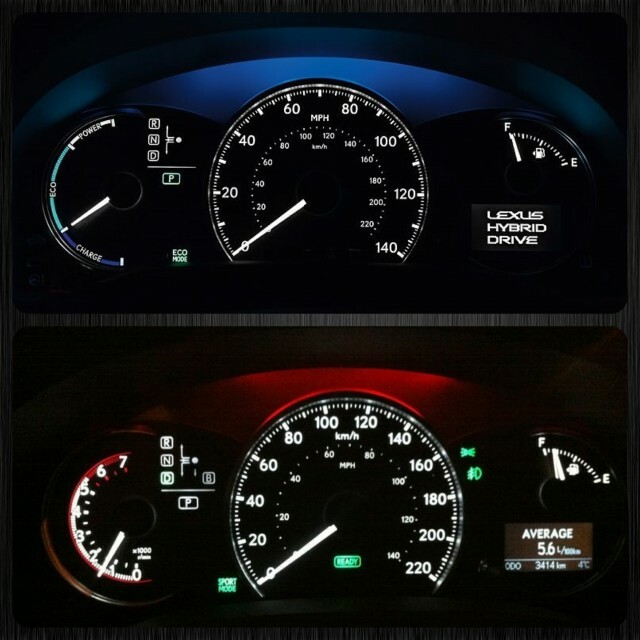 The climate control system is dual-zone and automatic. The CT has a push-start ignition, and of course power door locks, windows and mirrors. Overhead, there’s a power tilt/slide sunroof, as well as 3 HomeLink garage door openers – and a small back-up camera screen in the rear-view mirror. Here’s where things got dichotomous. The outside of the car says sporty. The seats and the cool techy interior say sporty. The drive – not so much. It’s a great ride, it’s just not very sporty. OK, so let me start with the aforementioned gear selector. I’m not sure if it’s part of the techy concept, because I’m sure a more traditional lever would have worked fine here, but what you get is a weird, spring-loaded joystick-kind-of thing. It floats in the middle of the gate, and allows you to snick the lever up into drive, or down into reverse, or to the right to a hill-start mode. Having done that, you’ll note it pops right back where it came from, but will follow your instructions pending on which way you shoved the lever. That part threw me a bit, but what took me even longer to get used to was that there is no Park setting. There is only a Park button, which is separate and sits below the lever. You need to push it to put the car into Park. Having had to slide an automatic gear selector into Park for the last 25 years made this quite an adjustment for me. But you get used to it after a couple of days. Alrighty, so the drive – it’s not fast. It’s a very smooth-accelerating car, with just a slight hint of a jerk when the car switches from full-electric mode to hybrid mode and the gas engine kicks in. It’s a slick and almost silent driving experience overall, and it certainly makes enough power for everyday driving, especially commuting. Where I found the car lacked was if you are expecting any spirited acceleration – at any speed. From standstill, or passing on the freeway – both are fine and dandy, but neither will be done quickly. There are 3 drive modes. Normal mode uses the hybrid as it sees fit, and tries to find the best balance in terms of drivability and economy. Eco mode will switch things up to make it as efficient as possible, and Sport mode modifies throttle and steering response to make things seem somewhat sprightlier. 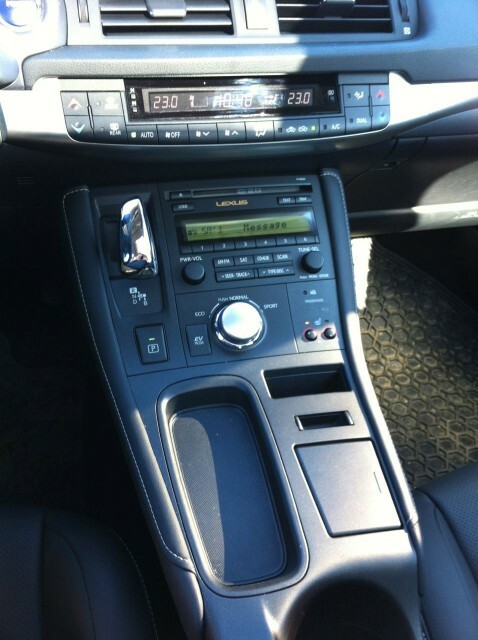 These drive modes are controlled with a large rotary knob on the console. Of note, there is also an EV-mode, allowing you do remain in electric mode permanently, until the juice runs out, but this would be a truly zero-emissions, albeit short, drive. The drivetrain is exceptionally quiet, as is the car as a whole. The ride is quite firm, but remains comfortable. Where the CT shines is in the handling department. Extremely competent around corners, it felt solid any way I tried throwing it and I liked the steering feel very much. Being a small car, it makes for easy low-speed maneuvering as well as parking and doing u-turns. Outward visibility – although you sit quite low, it’s still quite good. Rear visibility is hampered by the rear headrests, but they can be folded down when not needed, clearing the view to a relatively decent view. Remember I said this is a small car? If you’re doomed to sit in the back and you happen to have legs, you’ll know exactly what I mean. 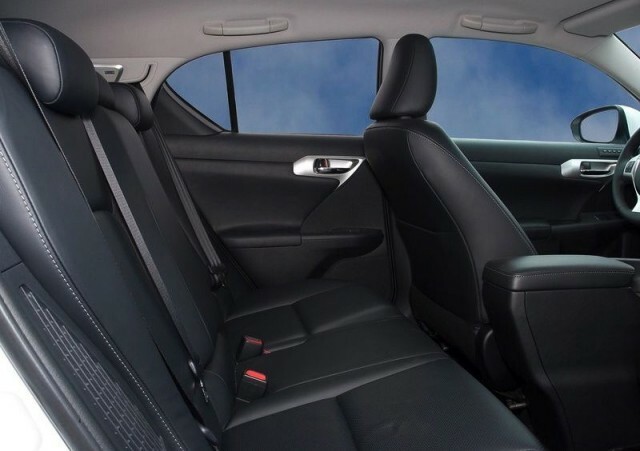 Although you’ll find 3 seats, 3 seat belts and 3 headrests back there, it’s really just seating for 2, and it would work out best if they’re well-behaved dogs. Adults won’t be comfortable back there, due to the very tight head, leg and foot room. My kids, on the other hand, were fine – although they found it a bit claustrophobic. There are 2 seatback map pockets, and a dome-mounted reading light, and 2 LATCH anchors for kids’ seats. It’s not a great place to be, the back seat, but it’s functional for short trips, or kids. That said, the seats are just as lovely as the front seats. So those well-behaved dogs would be traveling in the lap of luxury. Although there isn’t a lot of it here, Lexus does the limited storage well. There are a number of little storage areas, and most of them have nicely rubberized bottoms, which stops things from rattling around. There were a few things that really caught my attention, and I quite liked them. In the center of the dash you’ll find a storage compartment with a flip-up lid, opening up to a small but highly usable bin with a 12V plug. Perfect for charging things up. Of note, this flip-up lid is exactly where the navigation screen is if the car comes so equipped. There is sweet little vertical slot in the center console which you could stick parking passes, or cards of some sort into, or stand a smart phone. But you wouldn’t because your smart phone belongs in the shallow, 3/4″ deep tray in the console. It is just slightly wider than my iPhone, and about 50% longer, with a rubberized bottom. I’ve never seen a better place to set my smartphone on the road. You can also easily work with your phone there, if you choose to take issue with our distracted driving by-law. There are also a couple of cupholders, small door pockets with a bottle holder, and a small bin under the armrest lid. I found the trunk to be quite small – smaller than I expected – you get 14.3 cubic feet of room. Of course, Lexus had to put the battery for this car somewhere, and here it’s under the trunk floor. 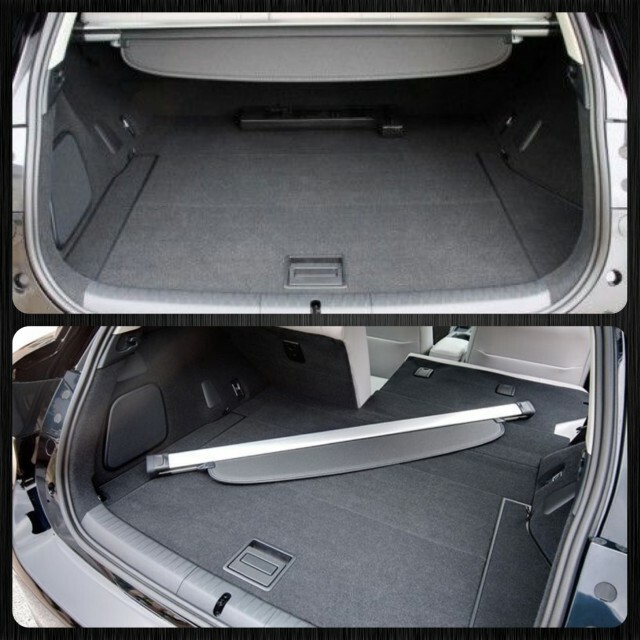 That makes the load floor higher than anticipated, and leaves you with a relatively small cargo area, which truly limits this car’s ability to hold more stuff for longer road trips and such. The cargo space is topped with a removable, retractable soft tonneau cover. That space is certainly augmented by folding the rear seats down – they split 60/40, and flipped down, leave you with significantly more room. In the center console, you’ll find a 12V plug, along with the auxiliary and USB plugs under a flip-up lid. I hate this, because your cables or USB thumb-drive would be sticking straight up out of your center console. I wish they would have hidden them in the arm-rest bin, or up in that cool dash bin. At first, I listed the weird gear selector thingy under my nitpicks, but I can’t say that anymore – I got used to it, and started to appreciate how little room it took up in the center console, leaving space for things I needed to access more often. I had a tough time with this one. First of all I was confused by the sporty look of the car, complete with slightly aggressive hints, and the completely non-sporty driving experience. Then I was quite taken with the handling abilities. Then I fell in love with the interior appointments and comfort and delicious materials. And then I felt let down by the very tight rear seats and cramped cargo area. It’s a weird car, that I thought competes with a bunch of different cars, on different levels, and hits some targets and misses others. It’s difficult to find a car that’s more fuel-efficient, and there it finds its trump card, and while doing so, it handles very well around town and on the highway. Yet it’s an expensive car compared to its Toyota hybrid stablemates, which will give you the same fuel economy, the same performance (maybe not quite the same handling though) and cost you less money, while giving you more in terms of utility and space. But then you can say you’ll never find that level of luxury, and cool tech, in those cars and if you want that, you have to step up to the Lexus. A car that I initially considered a competitor with many turns out to compete with very few, and in my opinion, might be a bit of a niche product. I did speak to two current CT-200h owners and both absolutely love them. Both advised they had a close look, had a drive, decided it was exactly what they wanted and took the plunge. Similar car shopping stories, similar love for their purchase. Of note, both owners were women, and said they knew other women who bought a CT. I give the CT-200h a 7 out of 10. I’m OK with the lack of sportiness in terms of get-up-and-go. I’m OK with paying more for a premium-level car. But I’m not as forgiving regarding the lack of rear seat space or the cargo space. If that improved, I’d gladly give this car an 8 out of 10. WAF (Wife Acceptance Factor) was very high. She loved the drive (once she figured out the gear selector), she loved the way the cabin felt snug around her, and she loved how it smelled. Hey, I’m just passing on her comments. Oh, as a final note, my review example came in Daybreak Yellow Mica, which struck me as electronic bile at first. Strangely, the color actually seems to suit the car, and it totally grew on me. Perfect as an everyday driver for someone who doesn’t need a lot of cargo space, and only occasional use of the rear seats, this funky little car with spectacular fuel economy loves to be thrown around corners at will – while surrounding you with techno-goodness, safety and luxury with the best of them. I’ve decided this would be the car I’d want to buy my daughter. Disclosure: Vehicle was provided by Lexus.